How to Check If Your Website Is Being Indexed Properly By Google? A common problem that is faced by many while trying to rank, in the Google search engine, is a website that is not being indexed in the correct manner. Such a problem means that Google is unable to access the web pages of your website to index its contents effectively. 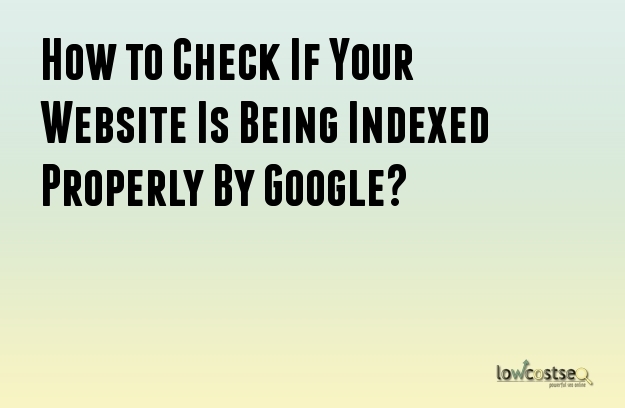 It is quite easy to check whether the websites are being indexed in the proper manner. You just need to log into your account in Google Webmaster Tools. There is a tab there caked the ‘Google index’. Clicking on this tab will show you the number of webpages that has been indexed by the Google search engine. Any drop in this number means that your website will be visited less and there will be a corresponding drop in the traffic levels of your company. A look at the Google index tab in the Webmaster Tools will show you whether all the webpages have been indexed. If your webpages are not being located by the crawlers then indexing will not proceed. You need to examine the possible issues, being faced by Google with your website, which are preventing the proper indexing from happening. If Google is experiencing issues with its crawlers, your website will not be indexed. You will need to head to the dashboard of the Google Webmaster Tools and check the messages under Crawler Error. The messages will show the problems being faced by Google crawlers for your website. The 404 HTTP is a status code and serves as a warning. It simply shows that the URL of your website cannot be located. It is the most common type of error. You need to ensure that the Robots.txt file has been scripted properly. This file contains instructions which tell the crawlers not to index certain webpages and specific parts of the website. If it has not been scripted properly, your entire website may become off-limits to all search engines. This is an invisible file that is present in websites. An incorrect configuration can cause multiple issues for your website. Most FTP clients will allow you to toggle the view of hidden files. You can then access this file. An incorrect Meta tag present in the source code can cause indexing problems. You need to check the source codes of all the webpages that are not being indexed to see whether they have improper Meta tags. A Sitemaps error denotes that the sitemap of your website is not getting updated in the correct manner. Instead, Google is continuously receiving the old sitemap from your website. Every time you correct issues mentioned by the Google Webmaster Tools, you need to run a fresh sitemap which will need to be submitted to Google. In order for indexing to take place, the crawlers from Google need to access your website through the server it is being hosted on. If the server remains unreachable, then indexing will not occur. You should check whether the server is undergoing maintenance or experiencing glitches.